Witch Hazel (Hamamelis) is a winter shrub that has a very nice fragrance due to its yellow/reddish flowers. You usually do not see this shrub growing until towards the end of winter. This plant can get as tall as 20 feet! Though some can also only reach about 6 feet high. 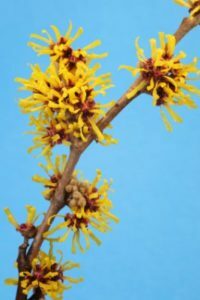 Though whichever height your Witch Hazel tree grows to, they are a pretty tall shrub!! The flowers on this plant are a yellowy/reddish color that resembles dry noodles. They look crisp and delicate. They are very skinny and look as though they could snap in half if touched. Plant this shrub in well drained, rich soil and watch it grow to its optimal height. They can be planted in sun or in shade. Either one will work for this tree like shrub. If you wish to have the wonderful scent of the flowers in your home, then simply cut off a few branches, once fully grown, and bring them inside. Enjoy this fragrant shrub from the end of winter to the beginnings of spring.